The Salter Glass Electronic Kitchen Scale features a simple, lightweight and a clear LCD display to give measurements in grams, kilograms and ounces. 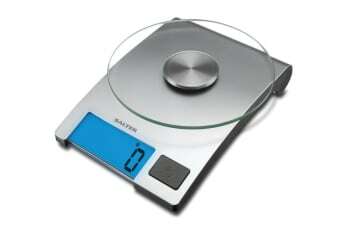 The Salter Glass Electronic Kitchen Scale has a capacity of weighing ingredients up to 5kgs. It has an ergonomic design and offers clear and accurate measurements, making it a great choice for everyday use. Very easy to use, takes mininmal storage space. Chose this product to replace my previous Salter which finally failed after many years of regular use. Had it only a few weeks but so far I am very pleased with it. I use it daily.